Not Sure How to Get Started with Creative Journaling? The Visual Encounters workbook is a practical ‘how-to’ guide that will help you learn your newly-discovered visual language. Written and illustrated by Priscilla Williams, this 60+ page pictorial guide will introduce you to the basics by exploring line, shape, color, and texture. It also includes exercises to help you get started as well as a “Tips and Tools for Journaling” section. God has given us many ways to relate to Him. The more we learn to relate to Him, the richer, deeper, and broader will be our connection to Him and to others. Blessings await for those who pursue this visual, creative language. Here’s Just a Sample of What You’ll Discover! Lines can be traced through conversations, through time, and through history. When we follow those lines, we learn more about ourselves, the world around us and our Creator God. 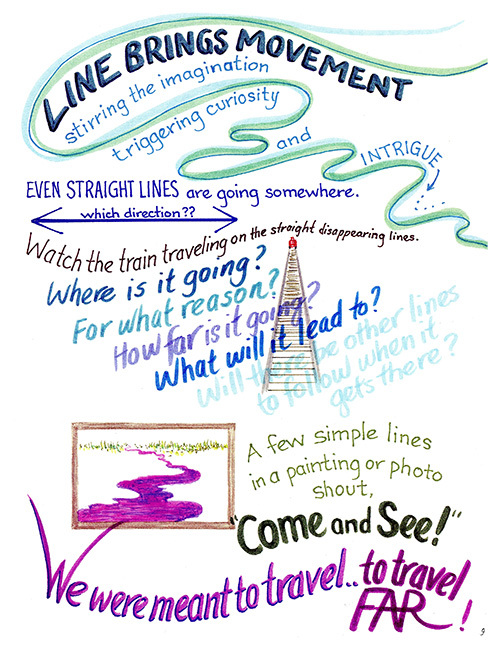 Lines bring movement; they stir the imagination, trigger curiosity and spark intrigue. Where is the line going? What will it lead to? Thick, thin, bold, and jagged lines- they speak, they move, they define, they free us to the undefined! Shape and line have an intimate relationship. Enclosing line creates shape. It is the space inside the line that enables line to be more defined the same way the context of a word allows greater definition. Create a motion, and you evoke an emotion! 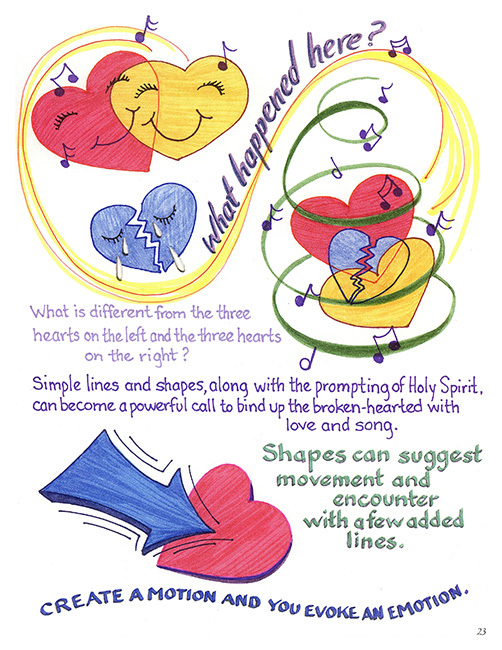 Simple lines and shapes can become a powerful call to bind up the broken-hearted with love and song. The more light – the more color. 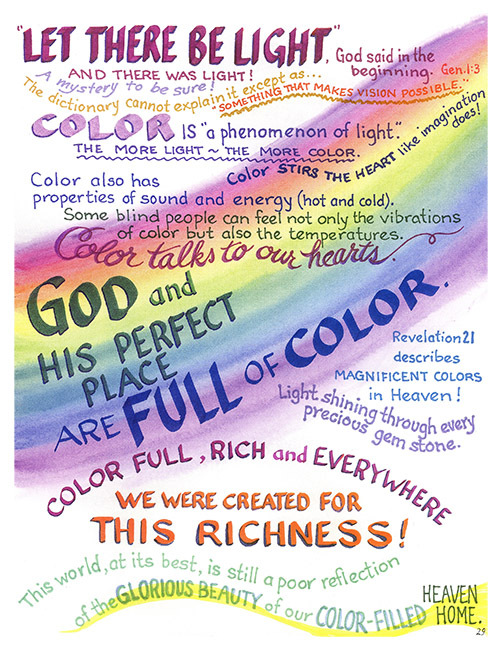 God’s wisdom is full of color and has many shades, tints, hues, and colorful expressions. Color added to line and shape increases movement in the heart and mind. This brings more connections between the mind and the heart. The more connections we have, the more freedom we have to become our true selves. 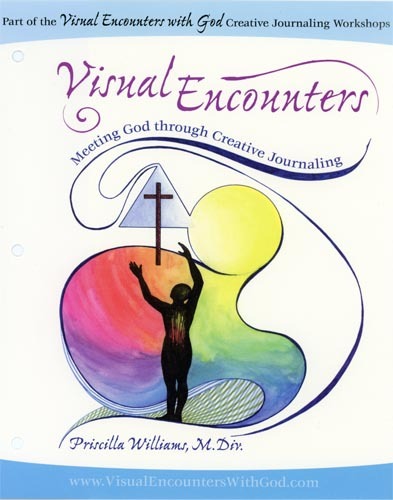 “This workbook was so helpful in getting me started with creative journaling. I don’t have any formal training in being an artist, so learning the basics was a lot of fun. It’s created mostly by line, dot and media. Texture gives even greater definition to line, shape and color. It draws out more of the senses for greater definition. 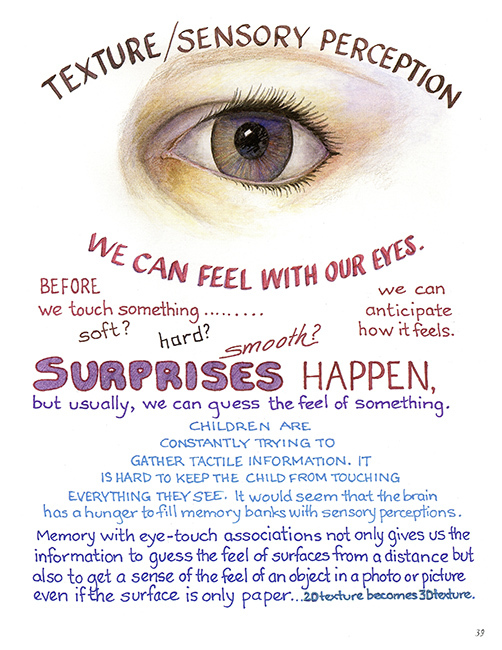 When we remember how things feel, we can use the language of texture to express the emotional associations they evoke. Visual and touch textures can help us know God better. As we increase our sensitivity to texture, we become more aware of what is being seen.